This is all in my basement. They are kitchen cabinets saved from a kitchen remodel years ago. Works great- puts the counter top at a good height and provides storage for all the pots, etc. It's an 8' wooden counter top that I got very cheap as bare wood and stained and varnished. Over that is two layers of wire shelving for closets, each with lights hung from it, so it's a total of 16 running feet. You can see the two blue heating pads, ordinary cheap from pharmacy. They've lasted a decade or so, so far, run 24 hrs a day for several months a year. 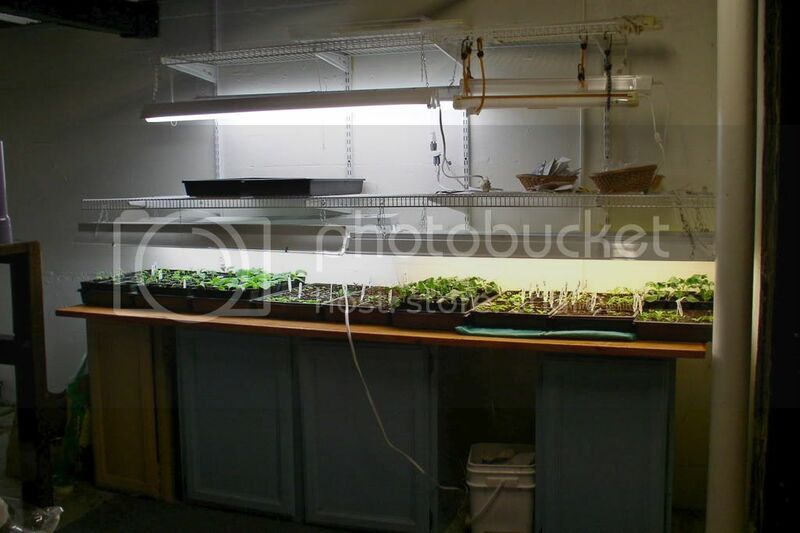 All the plants are in trays and I just bottom water by putting a little water in the bottom of each tray. I plant thickly in the 1x1" cells. 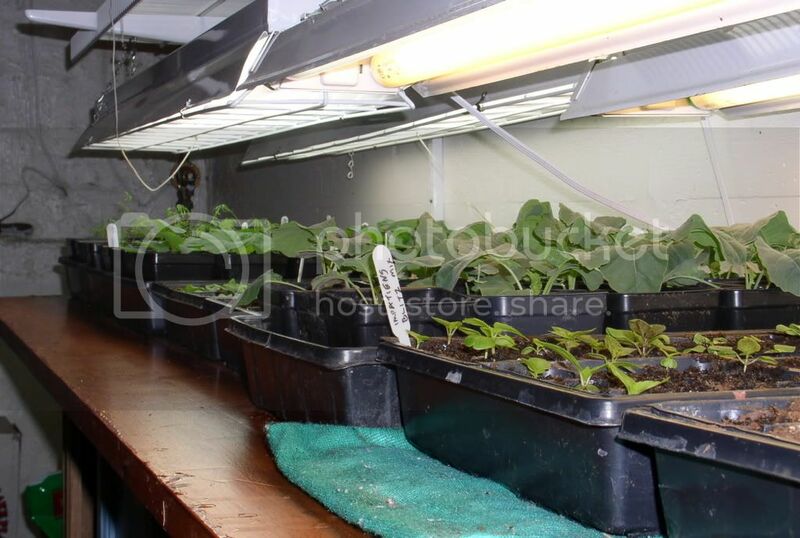 Every seedling is then transplanted 3 times: once to be one plant per cell, once into 3" pots, once into the ground. I'm gentle with the transplanting and it never seems to set them back. I sell off a few hundred plants every year as a fund raiser for my church and have everything I want for my garden, and it keeps me believing in spring all winter (first seeds started mid Jan)! Nice setup. That is one thing that I've always regretted WRT my house, not building a basement. WONDERFUL! That's a great setup. The pics look great. I don't have near the garden space to do much but I plan on giving some that I grow to family members that also garden. Cool idea for the fund raiser thing. I don't have near the space to use all the plants I start from seed. I just found it really addictive once I started doing it Seeds are so cheap (except when they are free --I do save some of my own seeds) and you have to buy them in packets, so frequently you have 50 or 100... I'm not good at throwing seedlings away. So I just grow them and then do the spring fund raiser at church and give away what I can't sell.. In the doldrums of winter, all the beautiful little plants in my basement make me happy. "I'm so excited, I just can't hide it! I'm about to lose control and I think I like it!" All I can say is I am green with envy! You've done a great job keeping everything nice and organized. I love how you set up your growing space to be vertical. This saves a lot of space. Space is a problem that I run across until I get my little friends outside for the summer. Do you have any issues with your basement getting cold or does it stay pretty warm down there? Either way, your plants seem to love it! the basement is heated, but no more than the house. We have a programmable thermostat that sets the heat down to 60 at night and during the day when we are at work. Its cool for them; that's why I use the heating pads to germinate things. After that they seem to tolerate it. Maybe grow a little slower, but since I start pretty early, it all works out, and maybe helps keep things from getting too tall and leggy and makes them a little tougher for setting out. I put things out in my garden earlier than most people in my area. good job! nice setup. i would put them at the window to get natural sunlight but your setup is also very well done. This is an amazing set up!! I am currently trying to figure out a good way to start my seeds out, and this was a huge help!! Once I have mine set up, I'll take some photos and share as well Thanks for sharing!!! whoa, I thought I was the only one looking forward already to growing this yr. I can't believe you are so far ahead, I haven't even bought my seeds yet! I am so excited to see your plants. The grange is having a seed sale starting tomorrow, forty percent off, outta my way, everyone! Gerri, that's a thread that was resurrected as people start thinking about seed starting again. The date on the original picture post is Feb 28, 2009. I have nothing but dirt sitting under my lights right this minute. I have planted the first tray of seeds, but just a few days ago, nothing is even sprouted yet. So relax, there's still time! So excited to see your set-up since I missed this last year... so excited to try "real" gardening this year!! Thanks for the inspiration! make reflectors RG : outa tin foil and cardboard. Mirrors work but are heavy. I wish i could start seeds,,but live in small mobile home,,my weener dog would probably eat them if i had a window sill. thinking about buying my diseased nieghbors 8x8 green house he built last spring,,but i don't think i would want to pay electric bill to heat it. just day dreaming out loud. Help with starting from seed! !